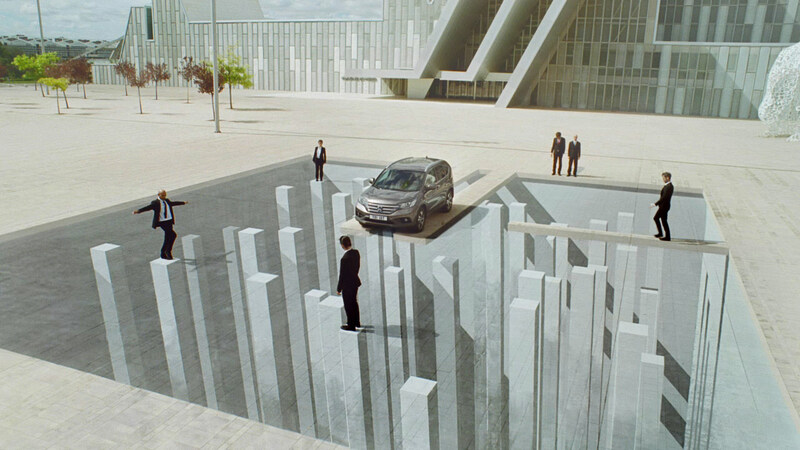 In mcgarrybowen's new spot for Honda, directed by Chris Palmer from Gorgeous, a CR-V 1.6 i-DTEC Diesel Honda is seen traversing a surreal landscape of complex illusions, each illusion creating a world of natural believability that turns in seconds, revealing a paradoxical solution that shatters your first visual instinct. Beautifully shot on location in Spain DOP Dan Landin captured the amazing art department sets and Trompe L'Oeil with painstaking attention to the daylight and the complex camera moves. Mill colourist Seamus O'Kane comments, "Shot on 35mm, the 2D post was completed in London using the raw film scans within a controlled workflow instigated by our London Colour Department. The careful liaison between our teams meant that the complex process of maintaining the in camera naturalism could co-exist with the requirements of an international client. My task was to maintain this into the final grade yet to create a strong visual impact that would draw the viewer into the illusion. As Chris was back in LA we relied on our intra office grade technology to enable virtual sessions with the agency and client in london."